I’m really trying to stick to a skincare routine a little more than usual although the usual isn’t really that bad. I love a good cleanser but sometime skip face mask (still been skipping them, oops) and serums but I’m working on it. I think putting in a little more effort can really make the world of difference and adding a few extra steps has meant getting lots of lovely compliment on my skin so today I am sharing a few of my current favourites. My current cleanser of choice is the Radical Hydrating Cleanser and I feel like I’ve been raving about it for months now but it’s just my favourite pampering cleanser that my skin loves too. 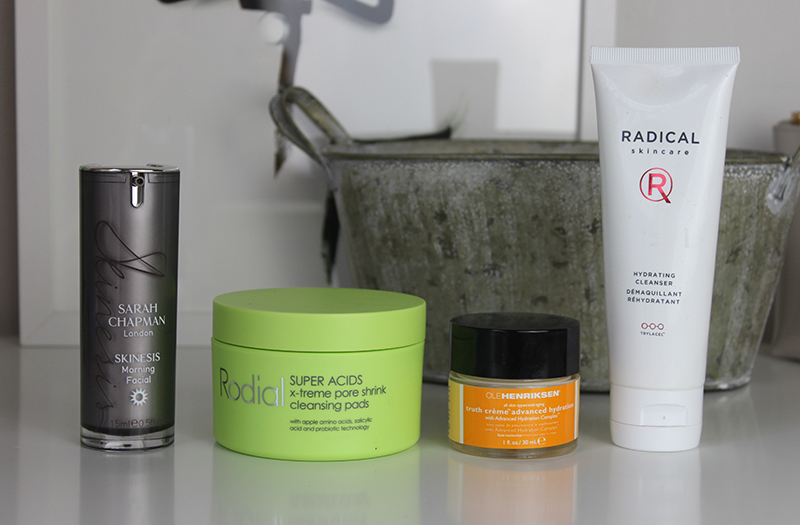 A completley new product to my skincare regime has been the Rodial Super Acids x-treme pore shrink cleansing pads, which Rodial claim do pretty much everything from cleansing the face and removing makeup to improving hydration and reducing pore size. I use these after I have cleansed to make sure everything has been removed and find it’s helped reduce blemishes whilst keeping my skin hydrated. I haven’t been using them for too long so haven’t seen much difference in pore size but think they are a great addition for anyone especially someone who has a slightly lazier take on skincare. My moisturiser of choice has been the Ole Henriksen Truth Creme Advance Hydration as I really help it helps balance out my dehydrate skin, isn’t too heavy and sinks into the skin almost immediately. That said I don’t love the smell, it smells of oranges but with a slightly off-ness to it although it’s years within its use-by date and I only recently opened it. I’ve done a whole blog post on the Sarah Chapman Morning Facial here but it really does give my skin a beautiful glow no matter how I feel in the morning. Everything I’ve spoken is a little on the higher end of the price scale but I just haven’t tried any drugstore skincare in a while. I would love some recommendations in the comments! 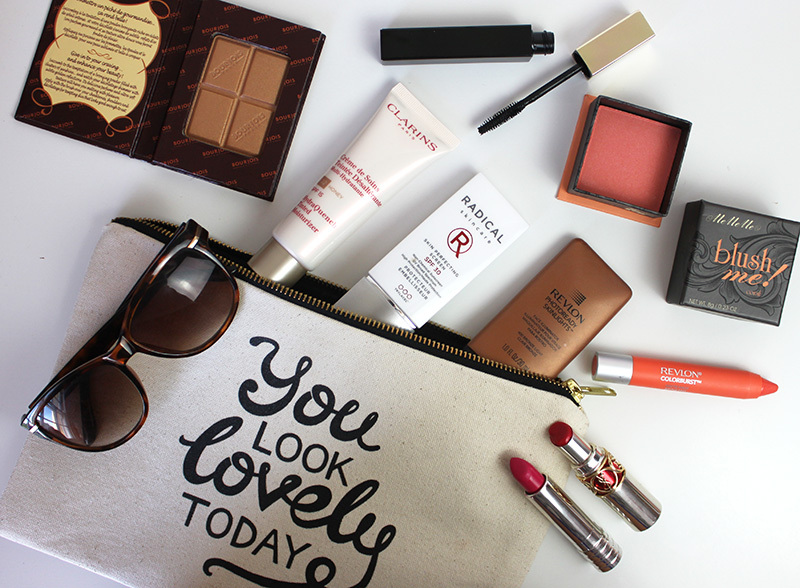 With the sales finally started I thought I would pick my favourite beauty items that have been discounted. They are old favourites, new discoveries of my own or products top of my own wishlist. It’s no secret that I adore the Juicy Couture Perfumes and I can’t get over how much of a bargain this one is! It’s not very often you can a good quality perfume for less than £40 and especially not under £20! Perfect summer scent, I own this and have been using it loads. Not really the most generous of discounts especially as it is an expensive product to begin with however I have heard this is one of the best fake tans going, just a little out of my price range. I love Nuxe and actually have been using this cream for a while now, its ideal for anyone with very dry skin but looking for something that isn’t too heavy or going to irritate their skin. I’ve fallen in love with this recently and although it’s reasonable priced to begin with the discount means it would simply be rude to not add one (or three) to your basket. This set comes with the classic Benefit Hoola Bronzer and They’re Real Mascara which alone retail for £40 and since both products are amazing it makes this a bargain! 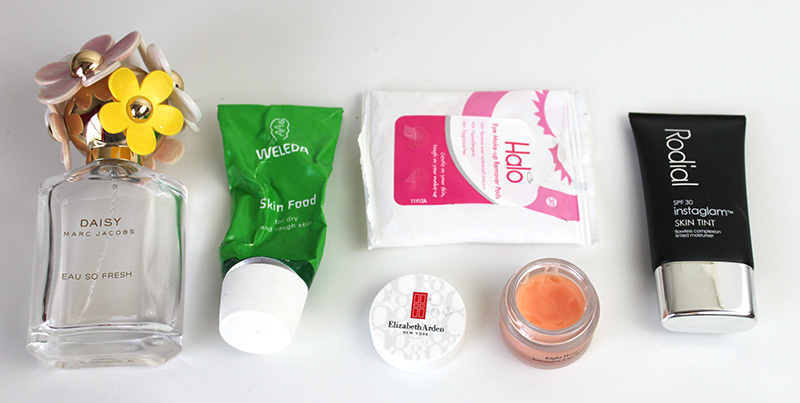 I also think the smaller size primers are ideal to travel with. I used this tan a while back and it offers a beautiful natural looking tan and the discount helps make this expensive tan a little more affordable. Tweezerman Tweezers aren’t cheap and I wasn’t too sure they were worth the money initially but they are life changing, nothing else I have ever tried compares to these. They make what I usually find to be a chore, much easier and less painful. Since this set comes with a mirror for just £12 I think it’s very reasonable, I also know it’s a slightly christmasy print but I don’t think that should be a problem. This is a favourite with most and an excellent body cream but at the normal £13 it isn’t the most inexpensive which is why it’s a great time to stock up. They aren’t all discount but there are still some great ones to chose from. 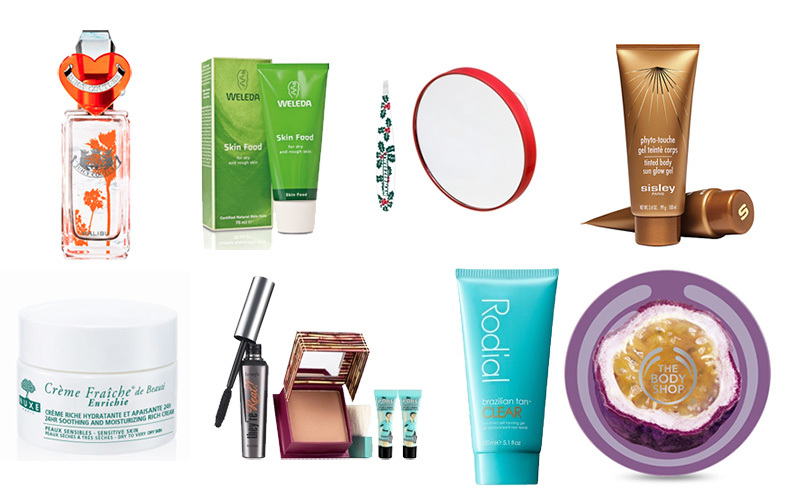 What Sale Beauty items have you picked up recently? A while ago I fell in love with the Rodial bathing balm, it is ultimate in luxury bathing. It smells amazing, has beautiful packaging, provides a gorgeously relaxing amount of bubbles and has a price tag to prove it. £35 is a little more expensive than my usual Radox bubble baths so I soon tucked it away for special occasion when I really needed a pamper. Recently I discovered The Body Shop HoneyMania Bubble Bath Melt which is a more affordable but still luxurious, smells A-mazing and leaves the bath filled with bubbles. 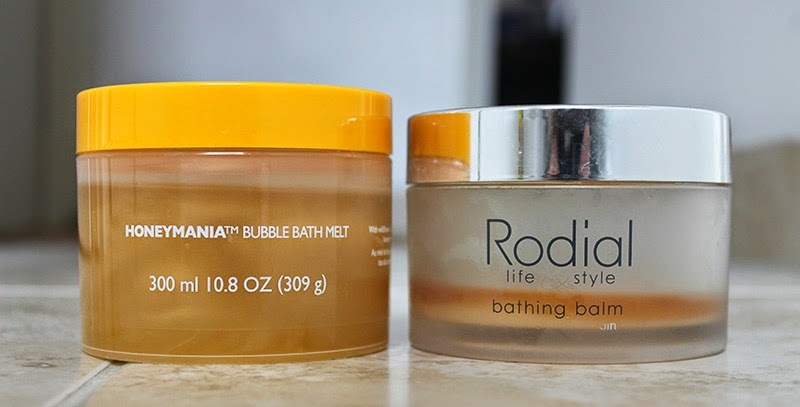 Although I still think there is something a little more luxurious about the Rodial Balm, I think The Body Shop HoneyMania is a great alternative. If you are looking for a bath which smells of honey and is filled with bubbles this is your product. What is your favourite luxury bubble bath? Have you tried the Laura Mercier Creme Brulee?